The international symposium on ‘Comets: A New Vision after Rosetta-Philae’ is being held from Monday 14 to Friday 18 November at the Musée des Abattoirs in Toulouse, organized by CNES, ESA and the IRAP astrophysics and planetology research institute. For the international symposium on ‘Comets: A New Vision after Rosetta-Philae’ at the Musée des Abattoirs in Toulouse from Monday 14 to Friday 18 November, 100 cometary science specialists from around the world will be looking back at the odyssey of Rosetta and Philae (2004-2016) and ahead to the future. For the first time in the history of space, the Rosetta mission escorted a comet and put a lander on the surface of its nucleus. For more than two years, the Rosetta orbiter took pictures of the comet from all angles and at exceptional resolution, accumulating science results and discoveries about the composition of comets, and finding compounds that could have seeded life on Earth. This symposium is the latest in a series of international meetings intended to promote the exchange of knowledge and ideas among cometary scientists, with a view to developing a comprehensive understanding of comets after the in-depth studies of Rosetta, Philae and other space missions and ground-based observations that will serve as an important resource for future studies. Launched on 2 March 2004 from Kourou by an Ariane 5 vehicle, the Rosetta mission reached comet Churyumov-Gerasimenko on 6 August 2014, a first in the history of astronomy. 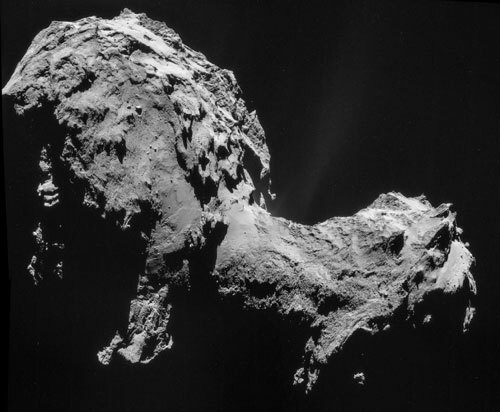 On 12 November 2014 the Philae lander touched down on the comet’s surface, another major first. The Rosetta orbiter then escorted the comet’s nucleus for 786 days before itself touching down on 30 September 720 million kilometres from Earth, marking the end of an odyssey of eight billion kilometres involving three flybys of Earth, one of Mars and a flyby of two asteroids.